Enterprise is better than the others in regards to age. They require you to be 21 versus 25 with most of the other big ones. 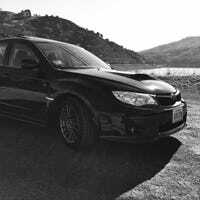 2014 WRX, but I did not get the touch screen/infotainment system. Still has Bluetooth and is supposed to “intergrate” with the Iphone. I just watched that whole video waiting for a crash. I am still waiting. What’s next? Murano Crosscabriolet? PT Cruiser Convertable? Except for the fact that it raised a TON of money and that money has already been put to good use and lead to some breakthroughs in the fight against ALS. Many of us have helmets for track days with stickers, artwork, etc on them. If you have one, take a pic and leave it as a comment. I’d post mine, but it is currently on a UPS truck en route to my house.